This note is to encourage your participation in Sharing Water — an event convening influential voices from government, civil society and business to explore issues and solutions to the world’s water challenges. 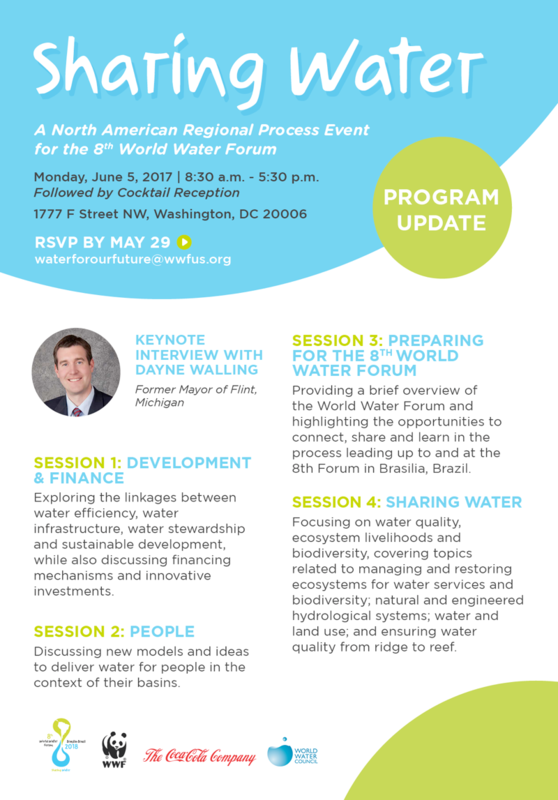 The event, scheduled for June 5, 2017 starting at 8:30 am, is co-hosted by World Wildlife Fund and The Coca-Cola Company and will also serve as part of the regional planning process of the 8th World Water Forum. The event will host a strong list of speakers, including a Q&A session and reflections from Dayne Walling, former Mayor of Flint. More details on the sessions and speakers can be found below and attached. Please RSVP as soon as possible to secure your spot as space is limited at the venue. The event is free to attend.